I have read a lot of books in my life but this is my first ever review. The challenges I had earlier on in my life propelled me to seek ways of inner growth and my first mechanism for doing this was reading. I read as much as I could once I realized that I was stuck in thought and that this was the cause of my suffering. I came across Letting Go when it was first published in 2012 because it was a natural extension to the emotional release work of Lester Levenson that I delved into a few years earlier. Previously, I had read the Sedona Method and found this fascinating. I often thought how could something so simple have such a profound effect? Letting Go is a detailed examination into our feelings and what it means to be human. It is an in-depth exploration into the very condition of our human existence and the experiences with which we find ourselves embroiled in. It is in my top five for spiritual self-growth literature. However, to call it only a spiritual book would be a miss-representation of what it really is. It is a practical look into how we can lead a more beautiful life by facing the one thing that we always try to hide and avoid, our feelings. I started by reading the book but since then I have listened to the audio many times. If you are new to this genre I would recommend reading it because some of the ideas, even though they are simply expressed, can be difficult to grasp. However, many times throughout the book you get those light-bulb moments of realization when you read something that you already knew deep down but never quite knew how to express. I found this happened to me more often than I had expected. This was especially unusual because by that point I had over 200 such books all saying roughly the same. I was getting tired of them because intellectually I had grasped many of principles and now they seemed repetitive. This was a sign of where I was on my journey. Letting Go, however, took my knowledge of emotional release to a new level. It inspired me to do my work with greater intention and persistence than ever before. After the introduction, the first chapter examines the actual mechanism of letting go. It examines what we currently do with our emotions which is suppression, repression and expression. It dives into each in depth explaining why these current modalities are detrimental to us. It then goes into the mechanism of letting go showing how this functions and what to do with the feelings and the resistance behind them. The key is to concentrate on the feeling and ignore all thoughts. Thoughts keep you stuck in the story and in doing so you abdicate responsibility for your life experience. Feeling is the key. Emotional Release is the key. Anything else is secondary. So, with that understanding behind you, Dr David Hawkins takes you on a journey through your emotions. All emotions vibrate at particular frequencies and the higher vibration of love is more powerful than the vibration of anger. He starts from the lowest frequency emotion which is shame and progresses onto guilt, apathy, grief, fear, desire, anger, pride, courage, neutrality, willingness, acceptance, reason, love, joy and finally peace. The lower frequency emotions are generally associated with lower power, poorer circumstances, less love and less abundance in life. He mentions that like attracts like and that individuals that generally vibrate at the lower frequencies attract similar like-minded people. One of the most powerful realizations I gained from the book was an understanding that almost every individual on the planet carries with them a huge quantity of suppressed and repressed emotions. Before it was something that I intuitively felt but upon reading the book I understood that no one was immune to emotional suppression. It was so prevalent in human society that everyone thought it was normal. It was something that struck a huge cord in me because from that point on I saw it everywhere and in every individual. People that I thought were generally quite balanced also carried a large amount of trapped emotions and now I saw why. 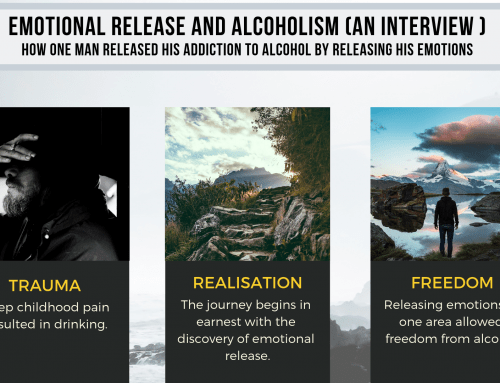 I also realised the vast potential of spreading the message of letting go to the world and that we could teach everyone how to release trapped emotions. The book continues with detailed chapters on all emotions, again starting from the lowest frequency emotions and onto the higher ones. Starting off on apathy and depression this was something that I had personal experience of but it took a long time to admit this to myself. I was stuck in a state of denial. The mask that I wore was final starting to become transparent. The very first sentence says that apathy is the belief that “I can’t” which is completely different to “I won’t”. We live in a world of “I can’ts” and it wasn’t until reading this chapter that I realized that my “I can’t” was really an “I won’t”. This brought about a shift and allowed me to surrender the feeling at an even deeper level then I had done previously. The next step in the scale of emotions is grief and the author judiciously follows on with great clarity about the amount of grief inherent in each of us. Men are especially prone to suppressed grief due to the stigma attached to this unmanly emotion. He shows how in this society grief is prevalent through all cultures but especially potent at this time on our planet. Releasing grief is therefore vitally important. He continues to say that the foundation of all grief is attachment and that attachment and dependence occur because we feel incomplete within ourselves. From personal experience this resonated with me deeply because from a very young age I have been struck with deep feelings of grief which only until relatively recently I started to process. All throughout the book the author mentions the letting go of our emotions. In the chapter on fear, he addresses the surrender of not just fear but also any resistance to it. By this very process this fear is now transformed to love. Owning our Shadow, a term popularised by Carl Jung is one of main catalysts to emotional development. The mechanism of projection is that which allows us to abdicate responsibility for our own shadow and therefore continue the cycle of suppression. Desire is one emotion that most of us feel we need more of. We believe that without desire nothing will come to us and by letting go of desire we will have nothing. Letting Go turns this theory on its head and says that only by dropping desire will we have what we want. This seems a contradiction to most of us and goes against popular self-development literature. However, the more you understand the mechanism of letting go and emotional clearing the more it begins to make sense. The chapter of anger brought about an understanding in me that I have been angry in my life because I am full of angriness. I understood at that point that in order to let go I had to take responsibility for the creation of this emotion in me. Letting go of anger was and still is one of my most challenging tasks. Often though, the external world brings me just what I need to do this. Moving on up the scale to pride, this emotion can also be seen everywhere in society. The author turns around the traditional paradigm of pride being a good thing into one where pride is actually a defensive mechanism, devoid of love, smug and judgmental. This can be seen by anyone who is prideful individual as they can easily attract circumstances into their lives where they feel attacked. The book helps explain why in many circumstances you have acted the way you did. It provides simple situations which undoubtedly you will be able to relate to and understand at a deeper level. For me I always judge the quality of such a book with the number ah-ha moments in gives me. Obviously, this changes for each individual but Letting Go is a book that will provide numerous readers with such moments even after the third or fourth reading. A friend of mine loves this book so much that he has listened to it over twenty times. I have also heard quite a few people tell me that this book has significantly changed their lives. The first positive emotion on the Dr David Hawkins scale is courage. The hallmark of courage is “I can”. In fact, courage is incredibly important within emotional release and letting go. It is the state which says I am not afraid of my feelings and I am ready to face them. The courage to clear our emotions is the first step that many of us take on this path. Accepting that everyone is doing the best that they can in each moment is the hallmark of the emotional state of acceptance. In this state, we become more responsible for the quality of lives and we understand that now we begin to be free of life’s problems. Here the author speaks from personal experience and often the reader can recognize times when he or she has been in such states. The book does not advocate a specific emotional release therapy but instead explains the simple mechanism in which to let go of feelings. All this is described several times throughout the book and by the end of you should have an understanding on how to integrate your emotions. The later chapters deal with the higher vibration emotions such as acceptance, love, joy and peace. Emotional integration of all suppressed feelings will eventually allow us to reach such states and if this happens on a global scale then the world we know now will be completely different. In these chapters, the author describes his own experience of reaching such magnificent states and what happened to him from a physical and psychological viewpoint. He explains how he went from a person with multiple illnesses to one totally free of such ailments without medication and just by using the mechanism of surrender. Overall this is a truly wonderful book. However, it is not for everyone. There are people who would say the mechanism of letting go is too simplistic for it to work. There are people that will doubt the theory that your suppressed emotions will attract circumstances into your life and that you cannot cure common diseases by releasing your emotions. Letting Go is a book I listen to for inspiration in doing my inner emotional release work. It has changed the lives of many of my close friends and it has also changed mine.